The Rio Grande's last new order for narrow-gauge Mikados was its Class K-36's acquired during the mid-1920s. These 2-8-2s have often been considered the best on the system offering good power and a responsive throttle. Along with the later K-37's nearly all survived until the D&RGW ended remaining steam operations at the end of the 1960s. Without doubt the K-36's are one of the best preserved class of Mikados from the railroad's fabled narrow-gauge operations. Today, all but one of these locomotives survive and all are either in operation or on display at the Durango & Silverton Narrow Gauge and Cumbres & Toltec Scenic railroads, both excursion operations using remaining sections of the network in southern Colorado and northern New Mexico. By the 1920s the Denver & Rio Grande Western was amassing quite a roster of 2-8-2 Mikados, which eventually replaced much of the railroad's older fleet of 2-6-0s, 4-6-0s, and 2-8-0s that had been used since the 1870s. Its first new Mikes were the Class K-27 "Mudhens" (the origin of its name has never been fully understood although a few stories persist) purchased from the Baldwin Locomotive Works in 1903. These locomotives were far more powerful than anything previously operated on the then Denver & Rio Grande's narrow-gauge network. While the K-27's did have their problems, notably a loss of steam resulting from a shallow firebox, in general they operated relatively well and were well-liked by train crews. It was another twenty years before the D&RGW acquired additional new 2-8-2s. During 1923 the American Locomotive Company delivered a batch of ten Class K-28's, numbered 470-479. Officially, the steamers were meant to replace the remaining 4-6-0s in passenger service but they were also used in freight assignments as well. The "Sport Models," as they were also called, could operate at higher speeds with their taller drivers and corrected some of the flaws found on the K-27's while also offering a bit more overall power. Interestingly, seven of the ten saw less than twenty years of service before being requisitioned by the U.S. Army during World War II for use in Alaska on the White Pass & Yukon Railroad. During 1925 the Rio Grande purchased its final new batch of Mikados. Once again turning to Baldwin the railroad picked up ten more, listed as Class K-36 and numbered 480-489. Like the Mudhens these 2-8-2s featured outside frames where the driving wheels were located within the frame and counterweights and crankpins placed to the outside. They were far more powerful than any narrow-gauge steamer operated on the Rio Grande at the time offering an axle loading exceeding 36,000 pounds and a tractive effort greater than 36,000 pounds (nearly 10,000 pounds more than the K-27's or K-28's). It is said that crews believed the K-36's to be the best Mikes on the network although they were noted for having a rather rough riding quality. 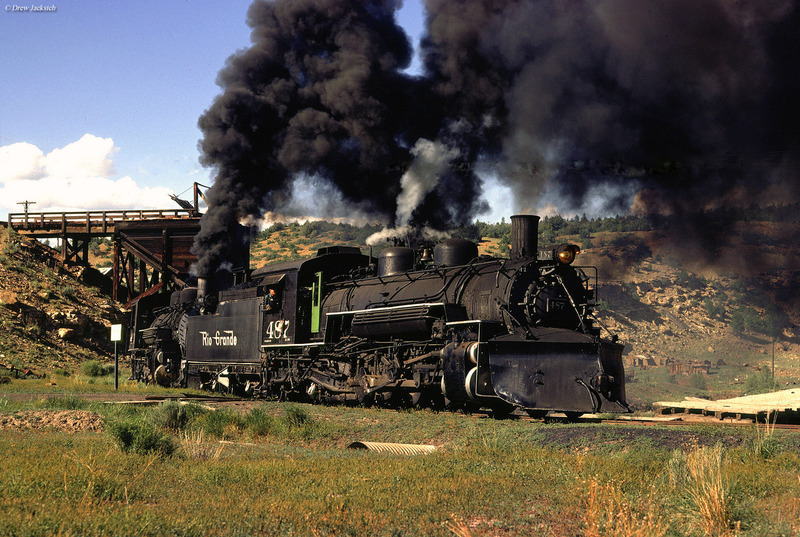 485 Baldwin Class K-36 1925 Fell into Salida, CO turntable pit in 1953, scrapped 1955. Three years later in 1928 the D&RGW rounded out its fleet of Mikados with another batch of ten, this time home-built its own shops using left over standard-gauged boilers from its older Class 190 2-8-0s. These locomotives were listed as Class K-37 and are regarded as the most powerful Mikes the railroad operated. 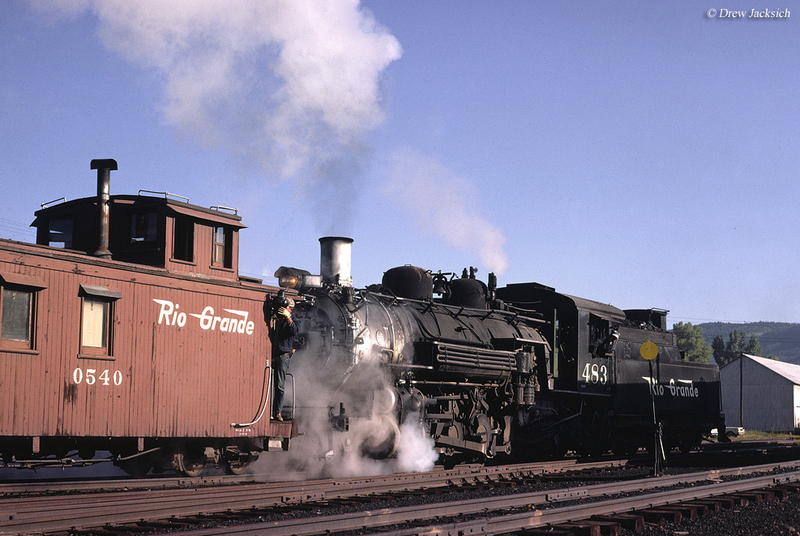 While the earlier K-27's and K-28's were stored or scrapped after the 1950s most of the K-36's and K-37's remained in service until the Rio Grande abandoned much of its narrow-gauge network after 1970. Incredibly, nearly every example of both classes are preserved today thanks to the forward thinking and generosity of the railroad, which donated the locomotives and the remaining trackage in southern Colorado and New Mexico for preservation. Today, four Class K-36's are in service on the Durango & Silverton Narrow Gauge (numbers 480, 481, 482, and 486) while five others are at the nearby Cumbres & Toltec Scenic, four of these are operational (numbers 484, 487, 488, and 489) while #483 has been on display in Chama, New Mexico since the 1970s. 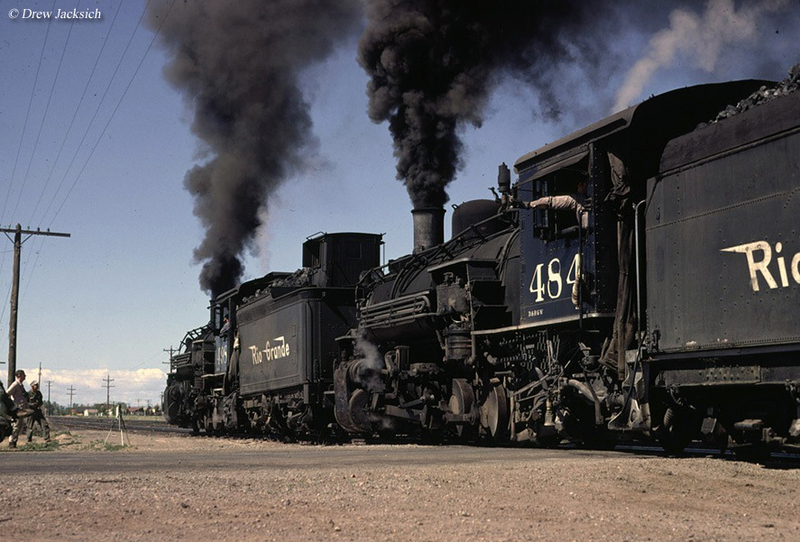 Only one, #485, was not preserved; the locomotive was heavily damaged following an incident in 1953 and was scrapped by the Rio Grand a few years later in 1955. Finally, if you would like to ride behind these locomotives you can do so on either the Durango & Silverton or Cumbres & Toltec Scenic tourist railroads.